The Minneapolis Yoga Conference was this past weekend. 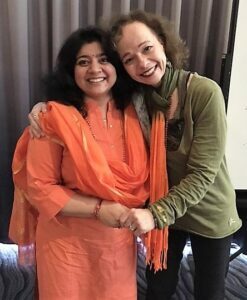 I was oh so lucky to be able to spend all three days participating in the Yoga Therapy Track with presentations by Indu Arora (as well as Molly McManus whom I had the absolute pleasure of meeting for the first time! Molly’s Soma Yoga therapy is definitely something I’m going to pursue learning more about!). I had experienced Indu’s wisdom a couple of years ago at the same conference for her presentation on mudras (yoga for the hands). I also attended her book signing for the launch of her amazing new book on mudras: Mudra: The Sacred Secret. I’d never experienced anyone with as much wisdom in her every spoken word. Believe me, you realize it when you’re in her presence—she’s the “real deal”. Are there any of you old enough to remember the commercial about E.F. Hutton? Well, the same applies here: When Indu Arora talks, people listen! So when the opportunity to participate in three days of an International-Yoga-Therapy-Association-approved therapy track this year featuring Indu on several compelling yoga therapy subjects, I knew I had to attend. She started and ended her classes succinctly on time, and when she gave a break, it was literally five minutes. No one complained, and they knew she’d be back to the discussion at four minutes 59.9 seconds! (And yes, it was a group of mainly women—upwards of 40 of us—with the usual three stall bathrooms in the area so getting through the line in five minutes meant there was no dilly dallying!) She joked once at the end of an hour presentation that her timer said 59 minutes and 59 seconds as she was completing her presentation. None of us wanted to miss a syllable! Seriously! There was so much wisdom packed into her presentations, she had our absolute complete attention. The expressions on my fellow-attendee’s faces reflected the same active listening I was experiencing. We were all gloriously present in the moment, ears wide open, not wanting to miss a drop. In India, where Indu is from, “a ‘Guru’ is a Sanskrit term that connotes someone who is a ‘teacher, guide, expert, or master’ of certain knowledge or field. In pan-Indian traditions, guru is someone more than a teacher, traditionally a reverential figure to the student, with the guru serving as a ‘counselor’, who helps mold values, shares experiential knowledge as much as literal knowledge, an exemplar in life, an inspirational source and who helps in the spiritual evolution of a student. The term also refers to someone who primarily is one’s spiritual guide, who helps one to discover the same potentialities that the gurus already realized.” Indu is much too humble to elevate herself to this description, although I suspect many of us view her as a true “guru”. I mean if she isn’t an expert, I could only hope to meet her guru! I left the conference with my heart full of gratitude and my brain soaked in “purposeful information”—her words describing the courses offered. By the way, one of her “asides” was that literally every Sanskrit syllable has 20 possible meanings and how it comes into contact with the next syllable gives the meaning direction. I learned so much this past weekend and I loved every syllable! I would love it if you would subscribe to my blog/newsletter. I don’t publish on a regular timetable so subscribing is a good way to make sure you don’t miss out on any amazing posts such as this one! (Poking fun at myself. 🙂 ) You’ll also be the first to receive updates, resources, and more. I’ll even give you a free gift! 🙂 Click on the “FREE Chakra-Balancing & Loving Kindness Meditation!” link in the right-hand column. Thanks! I’m old enough to remember that commercial. She is genuine and sincere, yet very humble. She touched a place in my heart that I didn’t know needed to be filled. Thanks for sharing your weekend experience.